Celebration time for Cliftonville against Portadown. Pic by PressEye Ltd.
Portadown arrived at Solitude with a new manager in place but the same old story on the final scoreboard. 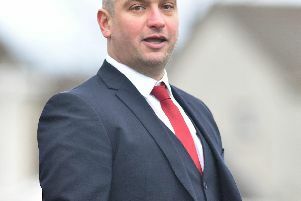 Niall Currie’s appointment as boss raised hopes within the Ports camp of an escape from the Danske Bank Premiership drop zone - but the final whistle extended Cliftonville’s fine run of form and left the visitors 12 games without a goal against the Belfast side. A lack of firepower left the Ports unable to take advantage of Jason McGuinness’ red card on 24 minutes following an incident with Garry Breen. Breen had also been at the heart of the game’s decisive moment when, on 17 minutes, a deflection off the Ports defender from Levi Ives’ long-range drive handed the hosts control. “That was a huge performance and result,” said Cliftonville’s Gerard Lyttle. “We felt our counter-attack worked really well. “We could have had two or three goals against 11 men with 10 if more clinical. “There are always questions asked and today the players answered everything. Currie finished frustrated at the shortage of scoring opportunities. “It was not about a lack of endeavour but we just did not work the Cliftonville goalkeeper or have enough quality in the final third,” said Currie. “I am getting to know the players and the only way to improve is by hard work together.